With prices as low as a dollar, the eye, lips, and face makeup brand ELF is an one to experiment with, and it definitely helps that they cover a wide range of products. 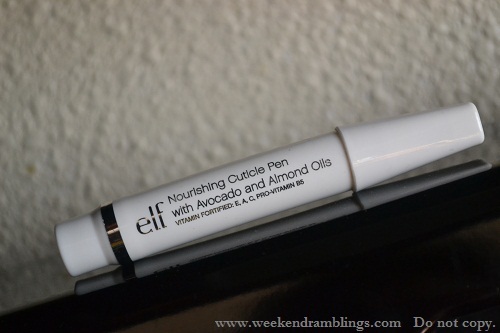 My latest find is the Nourishing Cuticle Pen with avacado and almond oils, vitamin fortifiers E, A, C, and provitamin B6. I was expecting something like a brush dispenser, but this cuticle pen is exactly like a big fat marker - complete with a thick flat applicator. This is nothing like the TBS cuticle pen that I have tried and hate. 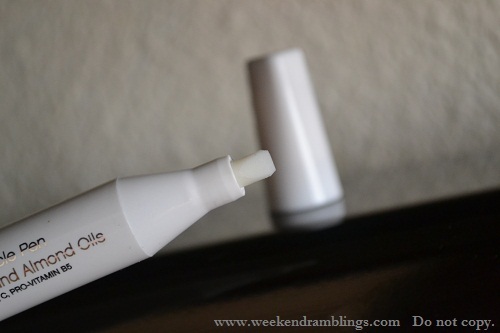 The firm white applicator makes it very easy to use, and I didn't find it hard or scratchy at all. It is the perfect design for pushing along the nail edges. The oil itself is quite light and gets absorbed quite easily. It not sticky and lacks any discernible fragrance, which to me is a plus point. whr to find ELF products in Mumbai??? :-? Manali - I think you have to order online, but I couldn't find the ELF India website if there is any.